Support for hit structure displays was implemented in 2017-2018 and released in BizInt Smart Charts for Patents Version 5 in July 2018. 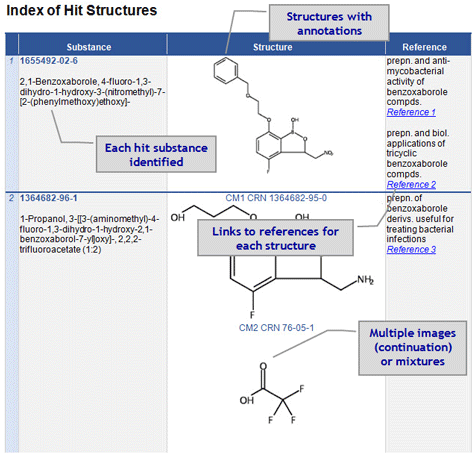 The new hit structure displays were developed in collaboration with customers at GSK -- learn more from this paper presented at PIUG 2018. Learn more about creating hit structure reports from this Creating Hit Structure Reports with BizIntSmart Charts for Patents (May 2018) presentation or this 30 minute webinar recording. CAplus transcripts from classic STN, new STN and STNext are supported. Classic STN: Using STN Express, display HITSTR, save transcript as RTF. If transcript opens in Word DO NOT SAVE! STNext: Display HITSTR. Turn off enhanced display. Save as RTF. We strongly recommend that you start a new transcript before your final display command. Click here for more details. New STN: Use the BizInt export – must include both REGISTRY and CAplus records in export. Click here for more details. The hit structures for each record can be displayed in the Summary Records export for Word. To create this display, go to File | Export, and select "Word - summary records." On the Summary Record Export Options panel (see below), check the Include Hit Structures check box. 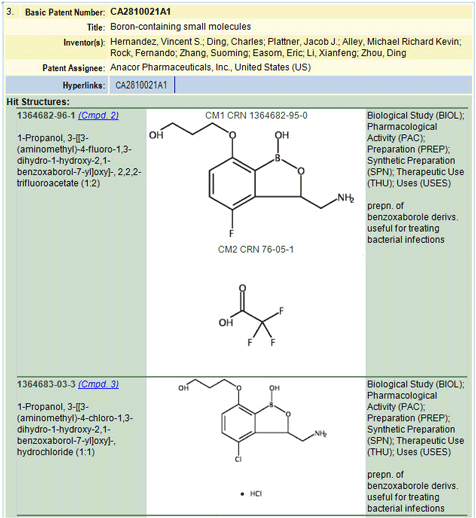 In the example above, the Links section and the Index of Hit Structures have also been selected. The exported Word file will contain a display like the one above, showing all the hit structures for each record. If the Index of Hit Structures was included, a link to the structure will be included (e.g. Cmpd. 2 in the example above. There is no limit on the number of hit structures that can be displayed for each record, but very large files could lead to performance problems in Word. More information on the Summary Records export. You can also create a structure-oriented Index of Hit Structures in the Summary Record export to Word. The Index of Hit Structures includes all of the structures in the chart, together with links to the CAplus records in which they were found. 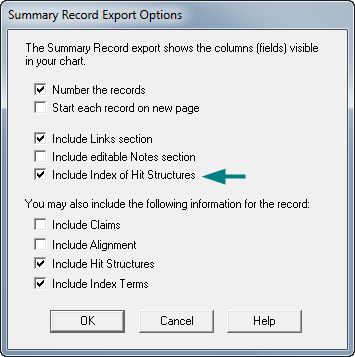 On the Summary Record Export Options panel (see below), check the Include Index of Hit Structures check box. In the example above, the Links section and Include Hit Structures have also been selected. You can select the Index of Hit Structures without choosing to display hit structures with each record. Note that the Reference column includes a link to the records within the report. We have also enhanced the presentation of Hit Index Terms from CAplus. These new features will be available any time a transcript containing HITSTR display format is imported. On New STN, these displays will be generated automatically from CAplus records if there are hit REGISTRY numbers within the results. 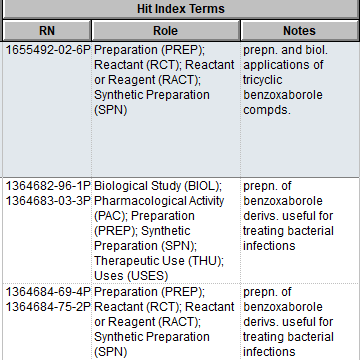 In the chart, you can display a Hit Index Terms column containing a subtable with REGISTRY numbers, roles, and notes. In the record display, Index Terms now appear as one coherent paragraph. 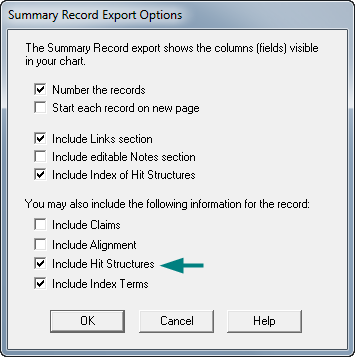 In the Summary Records export, there is an option to include Hit Index Terms in the green section. 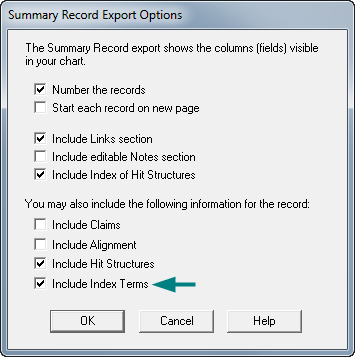 On the Summary Record Export Options panel (see below), check the Include Index Terms check box. Learn more about these features in this Creating Hit Structure Reports with BizIntSmart Charts for Patents (May 2018) presentation. Possible future developments include support for the hit structure display in more export formats, in the chart, and within the BizInt Smart Charts environment. We are considering extending this support to DWPI/DCR and to ReaxysBIB/ReaxysSUB, as well as to Markush search results.